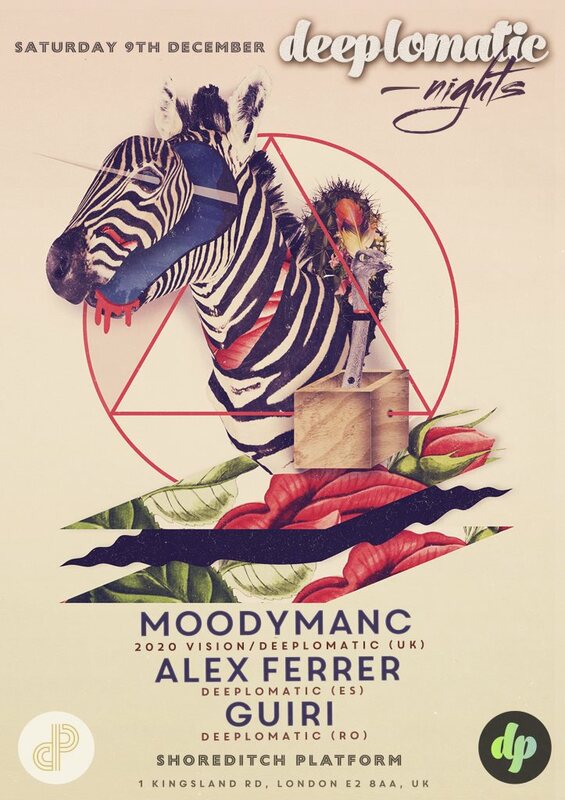 This time presenting Moodymanc (2020 Vision/ Exploited/ Suara) one of Deeplomatic´s music stalwarts along with the label big Kahuna Alex Ferrer (Spain) and the long time Disco favourite Guiri (Romania) a dream team that can´t be missed! “Moodymanc” has become one of the most respected names in house music today. The cheeky monniker was given as a nickname to Danny Ward by his cohorts at 2020 Vision recordings due to his heavily jazz tinged productions and Mancunian roots (Danny was a Hacienda regular and performer back in the day) whilst he was producing his two widely acclaimed albums and 12″s under the name “Dubble D” and as part of “2020 Soundsystem”. The rest is house music history with the first series of 12″s on his own imprint through 2020Vision leading to releases on labels including Tsuba and Dessous (as well as 2020Vision itself), and underground 12″s on boutique labels including Landed, Abstract Theory and Fly By Night. The considerable success and response of these releases, not to mention his chart topping eps “Black Paint”, “Joy” and “Father” have showcased his unique production skills and lead to him becoming one of the most in demand re-mixers around, keeping his name consistently in the bestseller and DJ charts and earning the respect of most of the big hitters on the scene, whilst his tribute re-work of Whitney Houston’s “It’s not right, but it’s okay” continues to be an internet sensation. Danny’s roots lie in his background as a jazz musician (he still regularly performs with some of Europe and the US’s finest) leading him to gain work with such beat luminaries as Rae and Christian, the Pharcyde, Fila Brasilia and many more before taking the drum and production seats in 2020 soundsystem with Ralph Lawson and Silver City, this led him to perform and dj at some of the biggest clubs, dance events and festivals across the world and has seen him create a large media presence having graced the cover of DJ magazine and been featured in all the Dance music glossies as well as the underground blogs. As a DJ Danny prides himself in bringing a smooth mix of his vision of the best in current and classic sounds from across the spectrum of house music incorporating a musicality and ability to read crowds that betrays his wide ranging background, experience and massive record collection. He is an expert at bringing the party on and keeping energy high and is equally at home on festival stages or in nightclubs. Strict door policy with ID scanner, please have ID with you to avoid difficulties – strictly over 18’s.